Here's an example of buckling in a thin walled steel frame (think beer can). 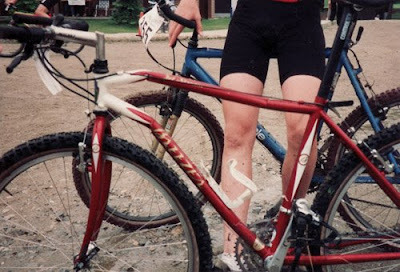 Shown above is a 20 year old Breezer MTB designed and built by the renowned Joe Breeze. I'm not sure if this was a stock frame at the time, but it appears that the tubing wasn't engineered to provide safety against buckling forces. This website reports that if the tube's outer diameter-to-wall thickness ratio gets above 60 or 70 to one, the tube is more likely to suffer failure from buckling. Hence, tubes this thin are not to be used on frames that could be subjected to substantial abuse off road. They will dent and buckle. It is likely that the rider in the picture above had a head-on collision (or even braked really hard as in this picture), and the compressive forces as a result were more than the tubes could handle. The way the tubes handled this load without breaking was to shorten in length and deform. The tube buckled just behind the head tube on both the top tube and down tube. In such a scenario, the front wheel is likely to move backwards, thereby striking the frame. In thin walled shell structures (bicycle frame, airplane fuselage etc), the buckling phenomenon is a very important mode of failure. It is often among the controlling design criteria and hence, a buckling analysis is always done. 1) Part dimensions and geometry : Length, and shape of cross section dictated by their area moment of inertia. 2) Modulus of elasticity E of the material, also called Young's modulus - a measure of stiffness of an elastic material. and I = Area Moment Of Inertia or Second Moment of Area. The buckling load is negative because it is compressive. The designer needs to ensure that this critical force is lesser than the maximum the structure can take to ensure stability. The interesting fact however, is that nowadays, frame builders and many bicycle companies don't have to grapple with this issue since they buy stock tubes from tube manufacturers such as Easton, Reynolds, True Temper etc. Therefore, it is the responsibility of the tubing makers to ensure that the tubes are designed to be stable. I have no clue how they size these tubes and what resources they use to do so. It will be interesting to learn. If anyone has any thoughts or comments to enlighten that process for us, comment away! Awesome post! Correct me if I am wrong but doesn't the constant in front of the Euler formula change depending on the end conditions of the members? Love the blog. 4tes : If you're talking about the K value, I'm sure for different boundary conditions, literature will ask you to use certain numbers. You'll have to consult reference books for that. Euler's formula is also to be used if the slenderness ratios (l/r) exceed ratios put together in reference books. If the slenderness ratios are too small, the calculated ultimate strength will exceed the yield point of the material and will obviously be incorrect. Ron: From what I remember--it was about 20-years ago--the rider was "just riding along". It was at a race and the circuit began with a long downhill section; it was at a ski mountain so there were some rather large water barrier/trough sections. The racer hit one of the barriers, it buckled the frame, and the rider stayed upright and rode to the bottom of the hill. Great blog! Very comprehensive and interesting. Early one morning we were off on a training ride together. Riding behind Greg was better than motor pacing. He lived in Seal Beach, California, and it was one of those gray early summer mornings where the color of the sky matched the color of the asphalt; it all looked the same. We have a 6 or 7 mile loop that included a long gradual rise that was probably 2 – 3 %. Greg had his head down and it was all I could do to stay on his wheel. I was riding a 53 – 44 chain ring combination and I remember being in the 44x15 up this hill. I looked up from his rear wheel just long enough to see him collapse his front wheel into the bumper of an illegally parked car (I don’t remember seeing it on the earlier laps, but it must have been there all along). His bike literally broke at the top tube/head tube join, and Greg went flying off onto the pavement out in the middle of the lane. Then it was my turn. My bike hit that bumper and I did a somersault completely over the top of the car, landing in front of it on my back. I remember looking up and seeing my bike land upside down on the saddle, pushing the seat post down into the frame. I got up and the only damage done to me was a fingernail sized hole in my Italian wool Bianchi jersey. My front wheel had collapsed, and the head tube of my Rickert bike was bent downward and the forks were not quite the same. To this day I have no idea of how or why I wasn’t just beaten to a pulp by such a hard crash. Not exactly a religious experience, but some might call it a miracle. Or just dumb luck. Thanks, Greg! Side note about Greg’s bike: It was made in Mexico, I believe by Windsor. They were made of Columbus tubing and were equipped with Campagnolo Record parts. His bike completely broke at the top tube/head tube join. Upon close inspection, it was apparent that the builder had cut his top tube to fit on only one end, which completely removed the thicker, butted end of the tube; thus the tube was wafer thin at the lug. A disaster waiting to happen and it did under Greg’s expert crash technique. note to self: don't run into parked cars? Badger brings up a thought -I wonder if that Breezer buckled where the tubing butts end/begin? I think that this is actually an example of bending not buckeling. Buckeling is due to a stress acting along the tube. Here the fork acts as a lever oriented at high angle to the tube and applies a bending stress. I'm not much on the physics, but I think you should be thankful the frame did bend and crumple. (crumple zone on a car)the frame probably absorbed 75% of your forward momentum, thus leaving you with a hole in your jersey.